How Much Money do Small Business Owners Make? Many people are curious about what the average small business owner earns. 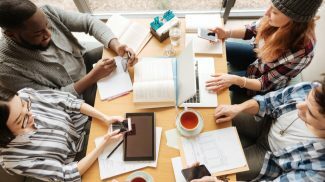 The IRS Statistics of Income provides some data on the average income of sub chapter S corporations and sole proprietorships, which helps to estimate small business owners’ earnings. 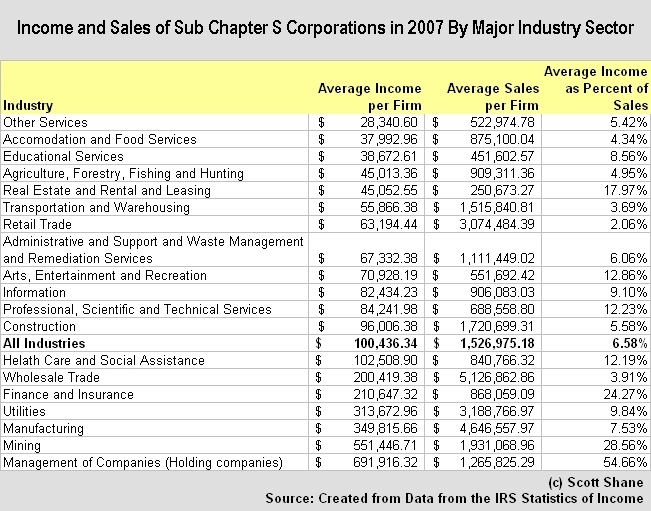 In the table below, I show the income and sales of the average sub chapter S Corporation in the latest year the data are available. The figure shows that the average S corp generated about $100,000 income on about $1.5 million in sales in the last year before the Great Recession. While the income of the average S corp was less than seven percent of its sales, there was wide variation across major industry sectors on this measure. Income only equaled about two percent of sales for sub chapter S corporations in retail, but almost 55 percent in management of companies, and almost 29 percent in mining. Similarly, wide industry differences can be seen in the average income of these businesses, ranging from only a little more than $28,000 in other services to $692,000 in management of companies. In fact, in four industry sectors – utilities, manufacturing, mining and management of companies – the average Sub Chapter S Corporation is making its owner rich by President Obama’s standards, generating more than $250,000 in income in 2007. More financially successful entrepreneurs tend to form sub chapter S corporations, and less successful ones tend to run sole proprietorships. The IRS Statistics of Income data also show how well the average sole proprietorship performed. As one would expect, the numbers are much lower than for the average sub chapter S corporation. In 2008, the average nonfarm sole proprietorship had revenues of only $58,256 and net income of only $11,696. But, as with subchapter S corporations, the the variance across industries in income and revenue is quite large. Because there sole proprietorships are more common than S corps, the IRS provides industry numbers at a much more fine-grained level for sole proprietorships. The IRS figures show that,in 2008, the average revenue of a sole proprietorship ranged from $11,862 for unclassified establishments to $1,073,406 for coal mines, and average net income ranged from -$47,455 for coal mines to $117,685 for dentists’ offices. 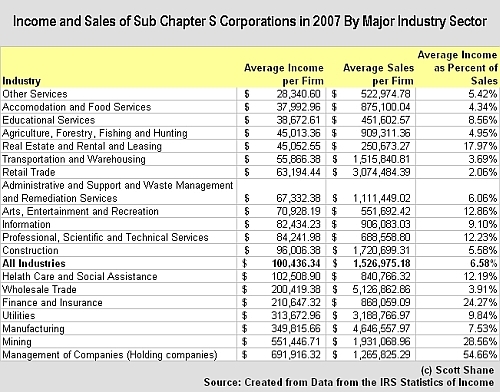 Click here for an Excel table that shows average income, sales, and income as a percentage of sales for sole proprietorships in 135 industries in 2008. Based on this data, what is the average point in revenue when a sole proprietor upgrades to an S corp? Also, thanks for the Excel spreadsheet. That is way easier than trying to mine that data out of the IRS data. Hmm… time to get into mining! You continue to be a source for dependable data and analysis. I appreciate your focus on the facts rather than wishful thinking. It would be interesting to see the median numbers instead of just the average. I wonder how much skewing there is. Excellent information, Imagine the 2009 and 2010 figures will show drastic reductions in income. I figure about 25% down over the last two years. Looks like many businesses are under reporting income or exploding taxable business expenses. Incredible. The figures for sales for my small construction company were spot on at $1,750,000 however my income was twice the average of 5.58 %. The only part he got wrong was that I am a sole proprietor but I earn like an S corporation. And that is for 2011. I guess I must be running a tight ship to make 12%. It just took eight years of hard work to get here. The statistics shown here are NOT what the owners make- these are statistics for the entire company. You need to divide by the number of owner/shareholders (not shown)to be able to compare to something like your own income. The average income per owner is far lower than shown here, per the IRS about 73k per owner across ALL of these industries. So don’t rush out to start your own business based on this. from a CPA. Though old, this is a great article. As a business owner running an internet marketing agency it helps see a few things a bit clearer. 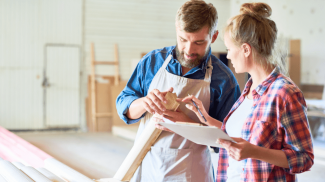 It’s true that business owners that run sole proprietorship can make less than one would think. Everything typically thinks a business owner would naturally make a lot more money. While this can be true, it’s also true that it’s tough going at first and takes a lot of dedication and willing to not make as much money as you thought. As Dixon stated, hard work, providing good value for your customers and long term dedication is where the payoff is.